Jesse was born on 11 October 1899 the fourth son of Maurice Reuben Buxey and his wife Elizabeth (née Martin). It was large family, as well as three elder brothers (one of whom, Joseph, died in infancy) there was an elder half-brother (from their father’s first marriage) and five younger siblings, two sisters and three brothers. The family lived at 37 Jack Street, immediately behind the Jack Hotel on Northbrook Street; the houses were not large, space would have been very tight. The site is now part of the Marks & Spencer store, close to the entrance from the Parkway shopping complex. In 1911 they moved a short distance to Winchcombe Villa on Marsh Road, which had much more space. This house has also been demolished and is on the site of the part of Parkway that abuts the entrance to the Camp Hopson car park. Maurice Buxey was a pork butcher; in his 1911 census return he qualifies this with the word ‘killer’ in brackets, suggesting he was slaughterman for whichever butcher’s business he worked for. There were five such businesses in Newbury at the time; one remains, Griffin’s on the Bridge, whose owner lost a son, Hedley Grifin, in the war. This was the nearest pork butcher’s shop to the Buxeys’ home, but he could easily have walked to work at any of the five. Jesse and his brothers attended the Speenhamland School in Pelican Lane, which is still going as a local primary. 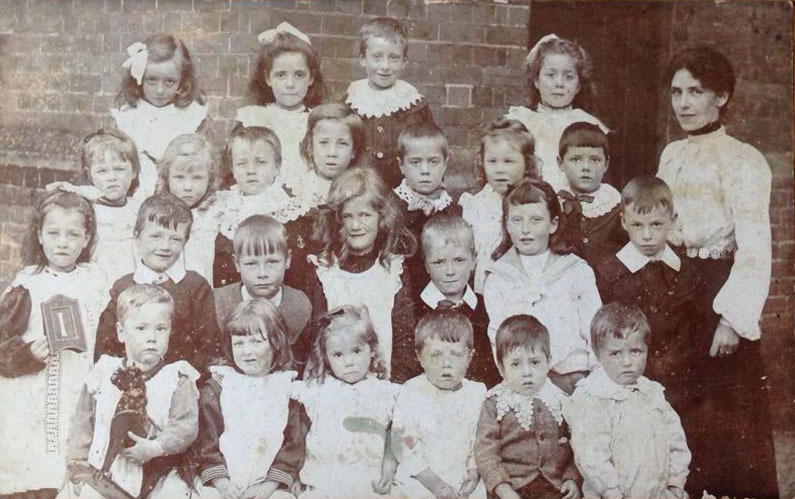 The family still have a superb photograph of the young schoolchildren in 1905, dressed in very fancy 'uniform' - including Jack, Fred and Jesse. 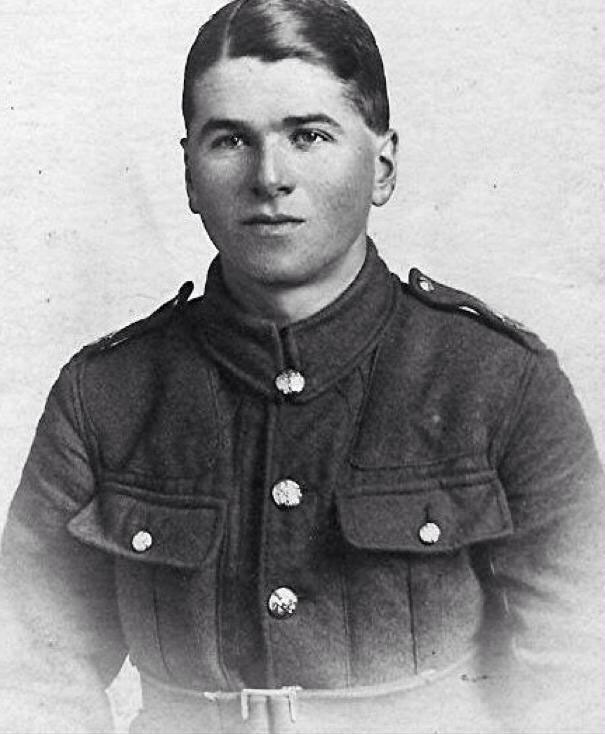 Jesse must have been called up soon after his 18th birthday for he arrived in France on 3 May 1918 having completed the necessary training in England. He served with the 1st Battalion of the Royal Warwickshire Regiment. By this date there was a deliberate policy of spreading recruits around the regiments; the earlier policy of recruiting ‘pals’ battalions having backfired on the Somme, when whole towns went into mourning as hundreds of their sons fell in a matter of a few hours. Nor was there any real distinction between the types of infantry battalion at this stage of the war, as it happened Jesse joined a regular army battalion but this does not mean that he had signed up for regular service, the majority of recruits at this stage signed on only for the duration of the war. On 4 May 1918 the battalion received a draft of 43 men, almost certainly including Jesse. They were in billets at Busnettes a few miles NW of Bethune. On 7pm on 6 May the battalion marched out of billets to take over a section of trench near Le Cauroy. The Battle of the Lys, a huge German advance that threatened to cut the British forces in two, had pushed the British line back several miles to this point during the preceding month. As the 1st Warwicks settled into the trenches there must have been concern that another attack could happen at any moment; but the German offensive had run out of steam a few days earlier. Jesse’s life in France was to fall into a routine, a few days in the trenches followed by a period in the billets at Busnettes, then march back to the trenches. This was to change at the end of August; the Allies had recovered from the German Spring Offensive and had launched their own offensive in the middle of the month. Before long the Germans were defeated, but Jesse was not there to see it; he died on the day the 1st Warwicks joined the attack on 30 August; they took heavy casualties from the start as they gathered at their assembly point SE of Remy Wood prior to the attack they came under heavy shellfire. Then they had to cross a stream and wade through a waste deep swamp to their objective (fortunately without much opposition). Delays caused by difficulties of communication and the terrain meant that they could only achieve two of their three objectives. Their second objective was an enemy trench on the far side of the swamp; opposition was light but they lost one Lieutenant another was wounded and a third gassed – suggesting that there were losses in the other ranks as well. The casualty figures in the battalion’s war diary show that 2 officers and 14 other ranks were killed that day, another 24 other ranks were missing and 127 more men were wounded. Two men returned from stays in hospital so that the strength of 39 officers and 907 men on the morning of 30 August had become 33 officers and 743 men the following day. 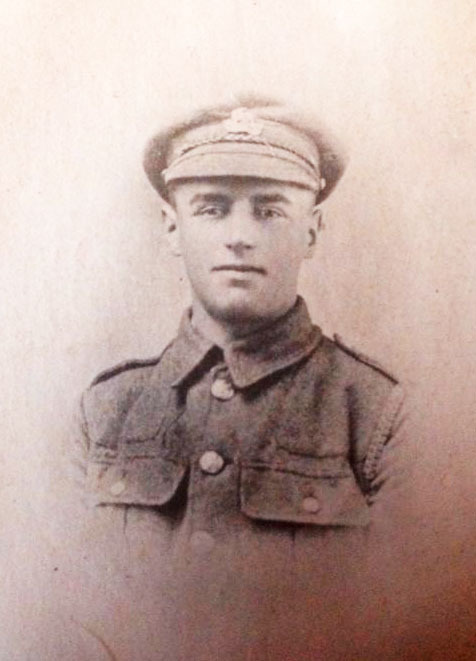 Mr and Mrs Buxey of Winscombe-villa [sic], Victoria Park, have received sad news, their third son, Jesse Anthony Buxey, age 18 years and 10 months, serving in the Royal Warwickshire Regiment, having been killed in action on 30th of August. He has been in France since the 3rd of May this year. They have two other sons serving, John, in the ASC, has been four years in the Army, and with the BEF in [sic – line missing] RFA, has been wounded twice, and was home on draft leave when the news of his younger brother’s death was received. The typesetter at the Newbury Weekly News was not on his best form that week – the miss-spelling for the house name is bad enough but the omission of a whole line is more of a problem. The two brothers serving in the Army were John Percival Buxey, who served in the Army Service Corps, and Frederick William, who served in the Royal Field Artillery. Frederick recovered from his wounds mentioned in the newspaper report. Despite the war ending in France, he was not demobilized immediately, instead he spent most of 1919 serving in Salonika before finally being discharged in December 1919. 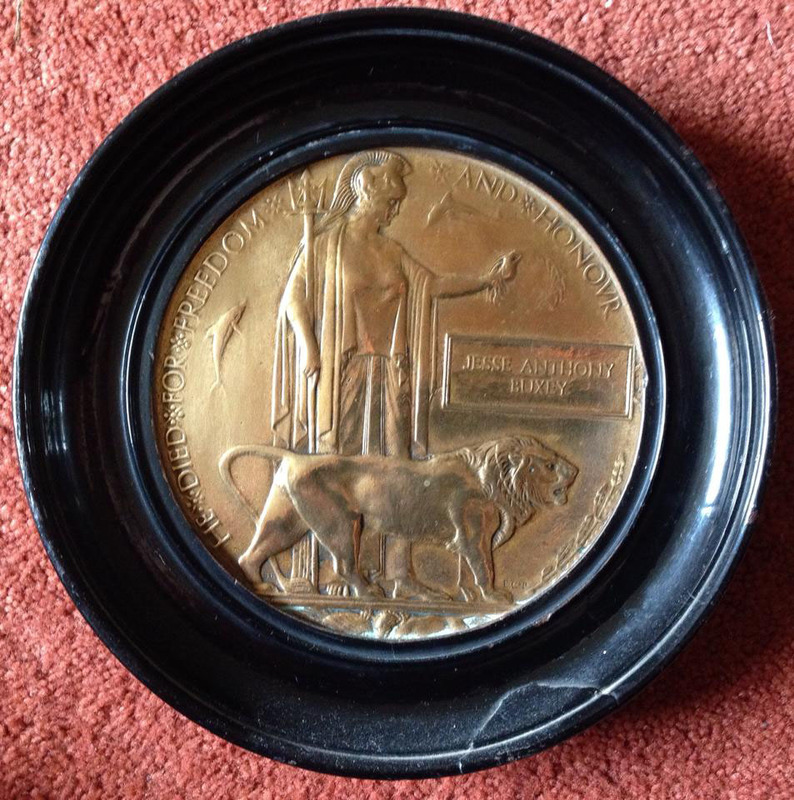 John served as a driver with the ASC (1 Company, 8th Division Transport) from the early days of the war, arriving in France in November 1914, in time to qualify for a clasp to his 1914 Star (only awarded to men who came under fire before 22 November). One can only imagine what the family felt if they read Jesse’s name in the Reading Mercury of 19 October 1918 – in a list of prisoners of war. Hopes must have been raised – only to be dashed. 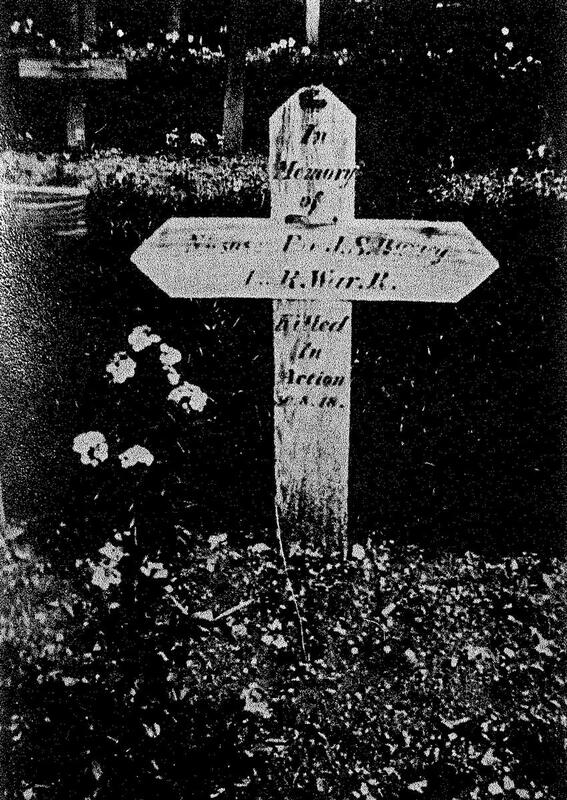 The entry was an error by the Mercury – the 8 October edition of the Official Casualty List (a regular publication that was probably the source of the Mercury’s casualty lists) listed Jesse amongst the recently deceased men of the Royal Warwickshire Regiment. Jesse’s body now lies in Vis-en-Artois Cemetery, Haucourt. This cemetery was started around the date that Jesse died but he was not among the early occupants. His body, and a number of others, were moved in January 1920, from Remy Military Cemetery. Remy was one of many smaller cemeteries ‘concentrated’ after the war., some simply to reduce the maintenance burden, others owing to difficulties obtaining the land from the pre-war owners. Locally he is remembered on Panel 9 of the Newbury Town War Memorial and on both the memorial board and roll of honour in St Nicolas’ Church, Newbury. 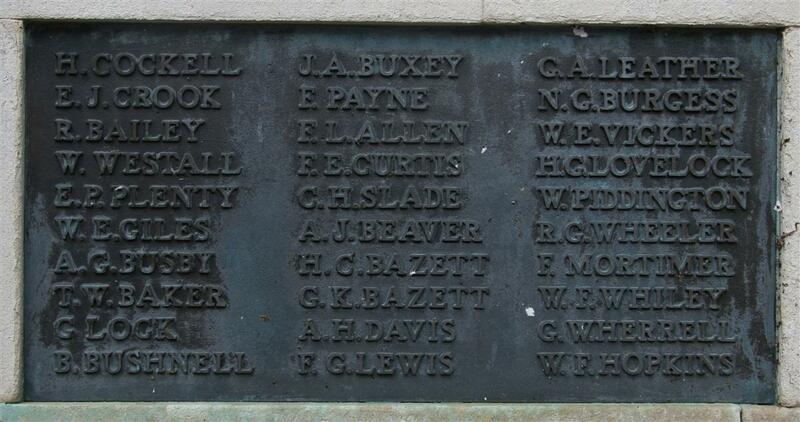 He was also remembered on the memorial, now lost, in Speenhamland School and, as 'Jesse Buxcey' on the splendid memorial tablet in Newbury's United Reform Church. Jesse's 'death penny', still a family treasure. After the war many families would never have seen the graves of their loved ones, indeed, a purpose of local war memorials was to provide a sort of grave substitute for relatives to vist and pay their respects. However, Fred Buxey was determined to see his brother's grave and travelled over to France on his motorbike in 1927 (or thereabouts) to visit the grave and take a photograph so that the rest of the family could see Jesse's final resting place. Jesse's death plaque, beatifully mounted in a circular wooden frame remains a treasured family memento of a young life, like so many others, cut tragically short. Thanks to Mary Buxey and Andy Buxey for the family photographs used in this story.